Though the kids may be home from school, that doesn’t mean they’re home all day. They may be racing off to friend’s houses, going off to the pool, or catching their golf lessons. When your family’s not at home, there’s no need to crank the air conditioning full blast. 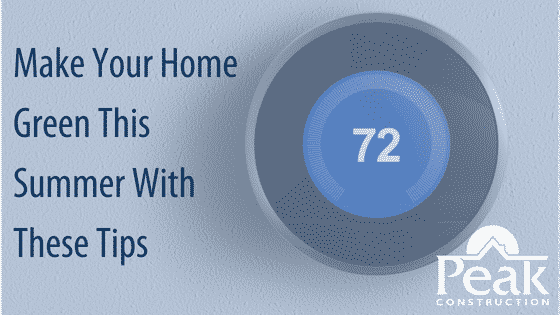 A programmable thermostat keeps you comfortable when you’re all at home, but also uses less energy when no one else is around. Purchase one to enjoy energy savings and lower utility bills. Exchange your indoor and outdoor lightbulbs for LED varieties this summer. They may come with a bigger upfront investment, but pay for themselves quickly, in longevity and energy efficiency. LED lights use significantly less electricity than their standard counterparts. This can reduce your carbon footprint and your electricity bills – which are already getting a workout from your air conditioner. The nurseries around town are full of lush and beautiful flowers – unfortunately, many of these come from distant places and require a lot of maintenance to grow in our area. The Hudson Valley is full of naturally beautiful flora – stick to these species and you’ll be doing less watering and upkeep. If they naturally thrive in your yard, they’ll look better, use less water, and you’ll certainly notice the difference on your water bill. Greening your home doesn’t have to be a thousand-dollar project. There are many cost-efficient steps you can take to see serious improvements in your home’s utility bills. Go as big or as small as you want this season – no matter what you do, you’ll see the difference in your wallet each month.